In March 2006, AWS announced its Simple Storage Service (S3). AWS S3 took off and launched a brand new category, Infrastructure as a Service (IaaS). Startups started building their services on AWS as most couldn’t afford to invest in their own infrastructure. After eleven years, both enterprises and startups have embraced cloud infrastructure services. Cloud infrastructure delivers several advantages over traditional datacenters. The biggest benefit of IaaS is that customers no longer have to worry about IT procurement, provisioning, and maintenance. With the cloud, customers have access to scalable and secure infrastructure for their business needs. Cloud providers remove the calculus of hands-on infrastructure management by delivering a high quality of service with flexible pricing models. Cloud-First Thinking & Enterprises: A Match Made In Heaven? Cloud infrastructure is becoming the default venue for enterprise innovation. Cloud services let enterprises test new business ideas and double down on winners without worrying about infrastructure investments. Take the case of Coca-Cola, a 130 year old company with operations in 200 countries. Coca-Cola’s New Zealand subsidiary wanted to infuse its 26,000 vending machines with smart capabilities. The upgraded vending machines can run special promotions and let customers order through mobile devices. Tapping into the power of the cloud, Coca-Cola is transforming customer experiences across critical touch points and enhancing customer loyalty with personalized services. While Coca-Cola is a poster child for the cloud, we’re seeing the emergence of cloud-first thinking in enterprises of all shapes and sizes. A cloud-first mindset helps you fast track innovation, drive agile decisions, and leapfrog competition. Freed from the constraints of datacenter economics, cloud-first enterprises think and act like startups. What underpins the rise of cloud-first enterprises? We recently surveyed IT executives working at companies with 500+ employees in the United States. Our survey shares five trends that are shaping cloud adoption in the enterprise. We've highlighted five cloud adoption stats from the survey that explain the rise of cloud-first thinking. When we checked on enterprise cloud usage, all our respondents were using cloud services. 44% of IT practitioners were using cloud services for more than three years. 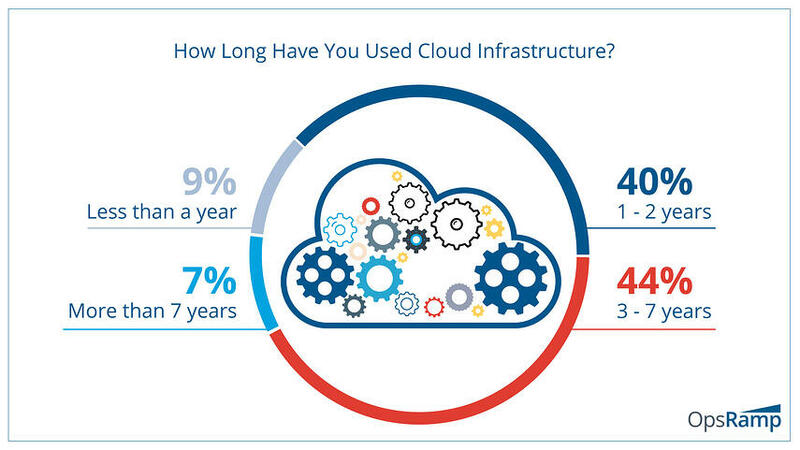 7% were running cloud workloads for more than seven years! Enterprises are just getting started with cloud services. 84% of IT decision makers expect to shift more workloads to the cloud in the near future. While most new apps are being written for the cloud, legacy services are also shifting to cloud. Which workload is frequently hosted on the cloud? If you answered staging or deployment, you’re mistaken. The most common cloud infrastructure use case is production environments (40%). The next two popular workloads are development and testing (32%) and disaster recovery (20%). Figure 3 - Production, dev and test, and disaster recovery are frequent cloud use cases. Cloud will grab an increasing share of IT spending. Around 60% of IT organizations currently spend more than 30% of IT budgets on cloud services. Going forward, expect 80% to invest more than 30% of IT spending on cloud services. Figure 4 - 80% will spend more than 30% of their IT budgets on cloud infrastructure. Cloud procurement will emphasize multiple providers instead of seeking out a single supplier. 75% of IT leaders expect to use a multi-cloud footprint for their enterprise needs. Two reasons for multi-cloud include cloud lock-in worries and the need to work with specialized providers. Figure 5 - Enterprises will use a multi-cloud strategy for cloud infrastructure. Our ‘Five Trends Reveal The Emergence of Cloud-First Enterprises’ report explains reasons behind growing enterprise cloud adoption. Read the report to learn how enterprises will drive innovation and productivity with cloud services.